The Boy surface is an immersion of the projective plane, a non-orientable surface. The image enhances the structure of the self-intersection of the surface including the single triple point. 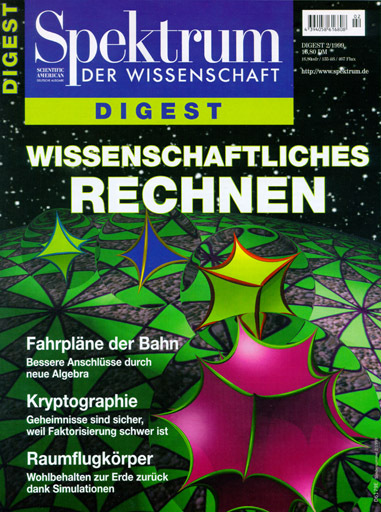 The image is used as cover image of an article by Ian Stewart in Spektrum der Wissenschaft. In hyperbolic space exist four regular platonic solids whose vertices lie in infinity. In the image Hyperbolic Polyhedra (K. Polthier, 1999) the solids are visualized in the Poincare representation where the infinite boundary of hyperbolic space is the unit sphere. Further details are available in the following article. English edition of video Touching Soap Films (A. Arnez, K. Polthier, M. Steffens, C. Teitzel) appeared in the new series of mathematical videos of Springer. 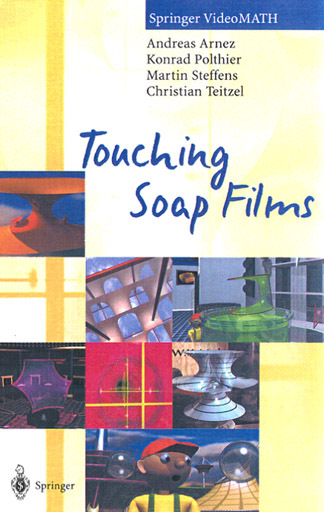 Cover shows sample scenes from Touching Soap Films. The Hyperbolic Minimal Surface (K. Polthier, 1993) is a triply periodic minimal surface in hyperbolic three-space. It belongs to a family of surfaces whose fundamental domains are given as solution of free-boundary value problems in hyperbolic orthoschemes. Details are available in the following paper. The Penta Surface (K. Große-Brauckmann and K. Polthier, 1996) is a new compact constant mean curvature surface with genus five and very few bubbles. Compact CMC surfaces have a long history in geometry, more details are given in Numerical Examples of Compact Constant Mean Curvature Surfaces. 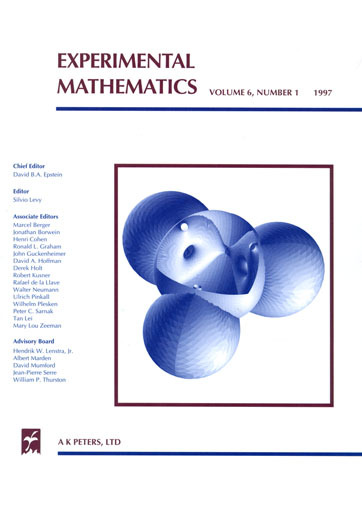 Hyperbolic Spaces (K. Polthier, 1995) can be represented by a number of different models. The picture relates the hyperboloid model and the Poincaré model, both being regularly tessellated by a 2-3-7 triangle. The picture is part of an animation of hyperbolic space shown in the video Touching Soap Films. There are exactly four Ideal Hyperbolic Polyhedra (K. Polthier, 1995), i.e. platonic solids in hyperbolic space whose vertices are at the sphere at infinity. The picture was created for an article of Ruth Kellerhals on the volume of hyperbolic polyhedra. The Kaleidoskop is a still picture by A. Arnez, K. Polthier, C. Teitzel and M. Steffens (1995) from an animation in the video Palast der Seifenhäute where Kalle enters hyperbolic space. The animation uses a specific arrangement of reflectors to obtain the kaleidoscopic effect. The cover of the german edition of the video Touching Soap Films shows the Bidenoid minimal surface discovered by H. Karcher. It's existence manifests the enormous possibilities in modifying existing minimal surfaces by including further catenoid ends. A animation of this process is shown in detail in the video. Cover picture by A. Arnez, K. Polthier, C. Teitzel and M. Steffens, 1995. 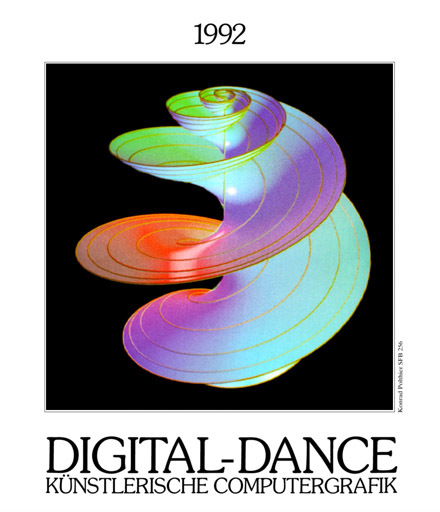 The calendar Digital Dance 1992 with cover image Cochlea (K. Polthier, 1991) was published by R. Saitzek Verlag, Bremen, with contributions of five authors. Together with Martin Rumpf I contributed a number of images we had made using the software GRAPE. 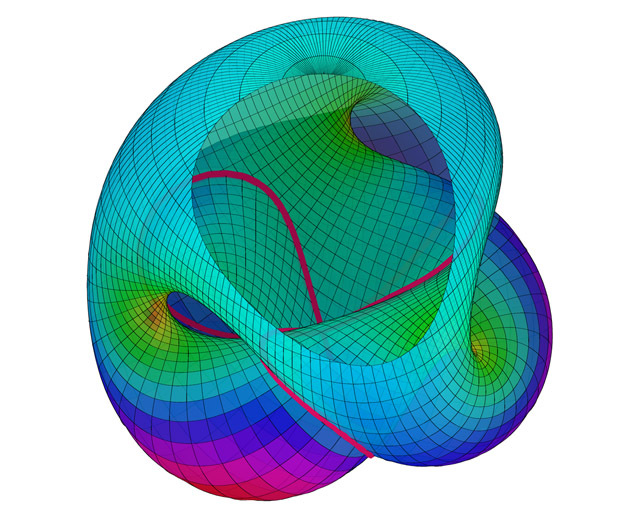 See the calendar section for further images and the article section for more information on hyperbolic minimal surfaces like the shown hyperbolic helicoid.